© Helen Maybanks, Sope Dirisu, a bloody iconic anti-hero for our time. Coriolanus may not be the most frequently staged of Shakespeare’s political Roman dramas although it nearly always gets included when a series of them are run together as here with the latest RSC season, under the banner title of Rome MMXVII. Trevor Nunn also ran them together as the Roman plays in 1972 and since then, there have been individual productions – none more striking than David Farr’s against-the-grain 2002 Samurai version with Greg Hicks. I say against the grain because in our aspirationally egalitarian times, we like to portray Coriolanus, the warrior hero flawed by his inability to make compromises or sell himself – unlike Shakespeare’s arch villain Richard III – to gain public approval as a furious anti-democratic exemplar. Hicks played Caius Martius with absolute haughty disdain. Personal honour and the elitist’s sense of entitlement was magnificently and radically riven into his soul. Tom Hiddleston’s Coriolanus for Josie Rourke (Donmar 2013) was by comparison, patently vulnerable whilst Ralph Fiennes turned him on film, after his first stab at it for Jonathan Kent’s Almeida-Gainsborough Studios outing in 2000, into a full-bloodied, Balkan/battle-scarred martial contemporary. Greg Doran’s Coriolanus or rather, season director, Angus Jackson’s is somewhere in between but in Sope Dirisu, they have definitely found a star in the making, a potential Othello if ever there was one. 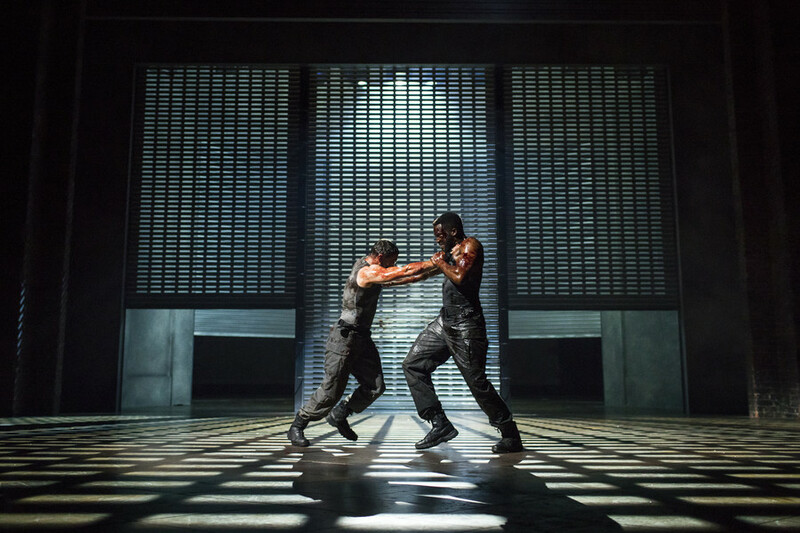 © Helen Maybanks, James Corrigan as Aufidius and Sope Dirisu as Coriolanus – two mortal foes but bound by a particular form of male bonding. Dirisu, making his RSC debut, an alumnus of the National Youth Theatre, has extraordinary presence, a rich vocal timbre and rare diction clarity. 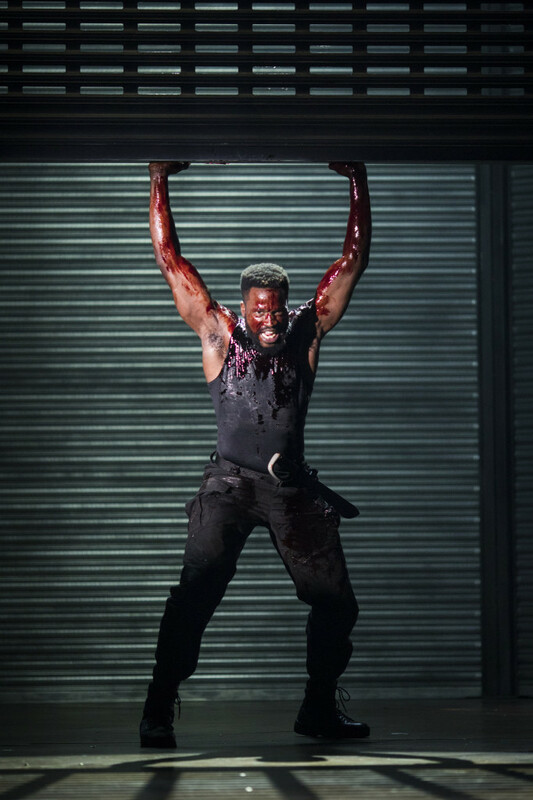 From the moment he enters, he strikes an imposing figure – an impression further heightened by Jackson in a production that heavily underlines the latent homoeroticism between enemy warriors, Coriolanus and his opposite number, the Volscian, Aufidius. Bathed in gleaming blood and sweat, Jackson’s iconography is surely taken from recent blockbusting cinema, such as Gladiator – magnetic if over-played by a rhapsodic aria suddenly arriving from Mira Calix’s accompanying sound score as the brutal one to one armed combat with Aufidius reaches its climax. As often remarked about Coriolanus, the political balance between ruling elite, patrician (politicians), the people’s spokespeople (trade unions, if you will) and the people/plebeians is left equivocal by Shakespeare. 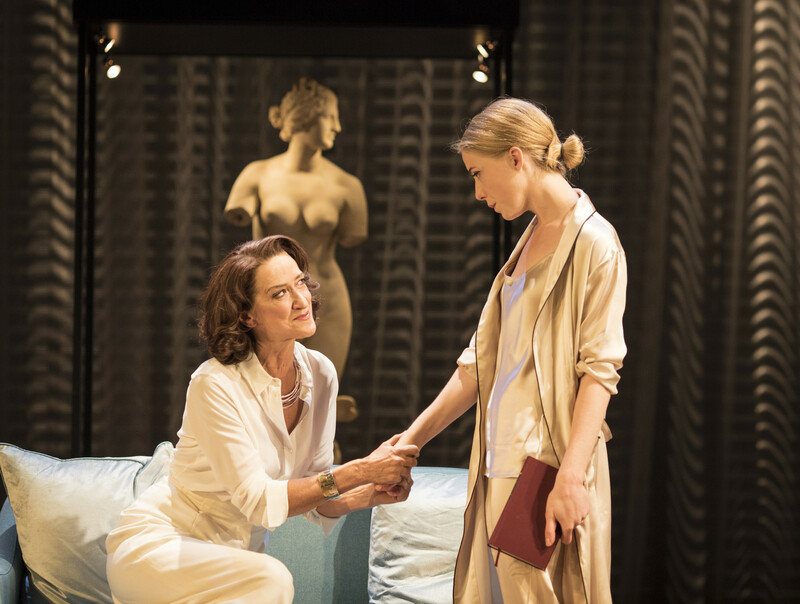 © Helen Maybanks, Haydn Gwynne as Volumnia and Hannah Morrish as Virgilia, the neglected wife to the mother-besotted Coriolanus. Jackson’s modern-dress version on Robert Innes Hopkins’ harsh, grilled setting, softened by some extremely well-cut couture outfits for the women, especially Haydn Gwynne’s mother, Volumnia, hedges its bets. Paul Jesson’s wonderful, dinner-jacketed Menenius is clearly a moderator used to negotiating and appeasing – an ability completely foreign to Coriolanus. Jackie Morrison and Martina Laird as the two Tribunes (usually played by men) are able rabble-rousers and as nonplussed as anyone when the public demand for Coriolanus’s head – or in his case, banishment – brings calamitous consequences: a march on Rome by the banished leader, now in cahoots with Rome’s sworn enemy, Aufidius. 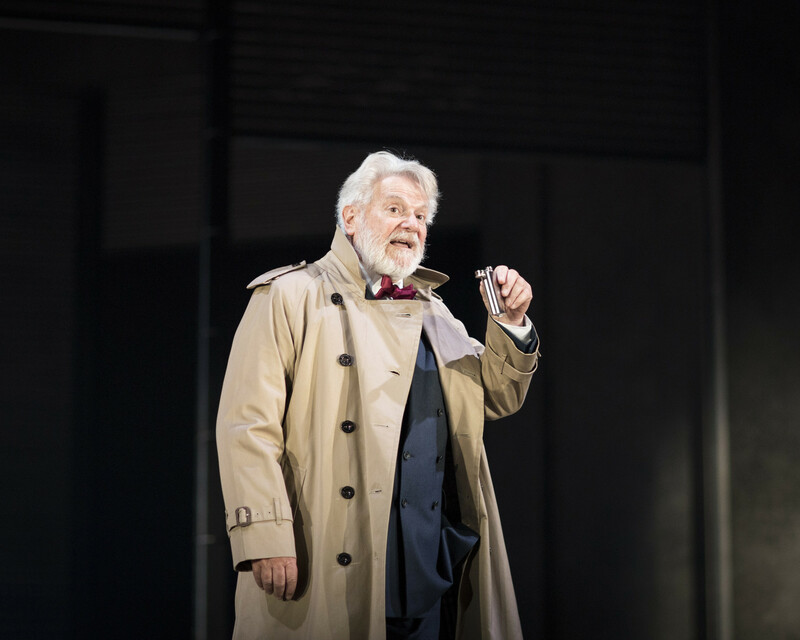 © Helen Maybanks, Paul Jesson as Menenius, an old senator – a tremendously effective, conciliating modern politician. There are clear echoes here for us, as alluded to in the programme about what happens when the people’s voice is given sway. Indeed, the strongest moment in the production comes with Haydn Gwynne’s tremendous Volumnia – glorying at every turn in her son’s mounting battle scars – prostrating herself with her family, begging for mercy to save their city from destruction. Not having seen the production in Stratford, I can only report too, that despite the strength of the performances, the production looks and sometimes sounds a little overawed by its Barbican space. Such a strange irony since the auditorium was built when the RSC were the resident company and specifically designed with Shakespeare and its delivery in mind. Still, with three more to come, Julius Caesar, Antony & Cleopatra, and Titus Andronicus, judging by the warmth of the reception, this is still a season of changing political insights fortunes, in tune with our own volatile, shifting times, to be enjoyed and appreciated by many. Clifton Bloice, Morgan Cave, Rosemarie Clarke, Joe Deverell-Smith, Brandon Dodsworth, Katherine Gee-Finch, Frederick Goymer, Norma Julius, Robert Moore, Sandra Panton, Rebecca Pratt, Karen Rowley, Shiv Sharma, Nalina Tobiere, Caroline Ward, Anton Wright. This entry was posted in 2017, Reviews and tagged Angus Jackson, Barbican Theatre, Greg Doran, Haydn Griffin, James Corrigan, Paul Jesson, political leader unable to compromise, pride and revenge, Roman season, RSC, Sope Dirisu on November 10, 2017 by Carole Woddis.